I was looking to get into another series as I just finished the After It Happened series and I have a vacation and a couple long flights coming up. I couldn’t wait though and had to dig into this. Military Sci-Fi is my downfall and I wanted to see what story made R.C. Bray want to narrate it. Do not judge a book by its cover, but we all do. It is not fair. It is important that the cover does show some things though. 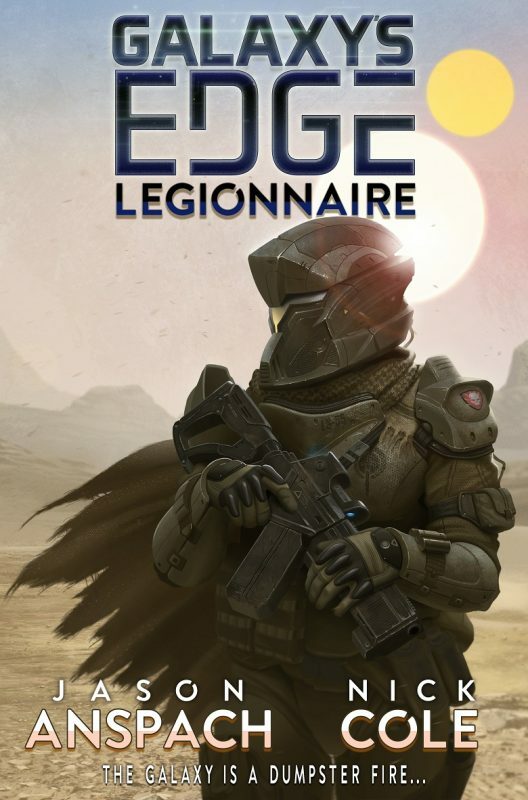 In the cover, shown here on the right, it has a helmet, desert landscape, armor, gun and makes you think about everything because of the environment. The setting intrigued me. So I dug in. This is a military book with all the similarities to our existing military. You have a regular branch and then you have the elite squads. The elite squads are better and they know it. The regular squads are weak and ruled. The elites think on their own and survive. Legionnaires do not think highly of regular squads. The initial battle incapacitates the company leader. Questions abound on the future leadership. Should it be military or governmental appointment. You will read the term “point” many times and this is where it came from. Military regulations determine the leader. This conflict bears through out the rest of the book. There is great detail about the battles and though there is the leadership squable, this book is mostly about battles. Anspach and Cole really know how to build on this tension of leadership and how it plays out. The battle scenes pull you in. The military gear pulls you in. The intersquad fighting pulls you in. They also are able to mimic this book to today with how we are fighting over resources in our own world. This military engagement is all about protecting an elected official who is no doubt selling out his world for their own gain. These legionnaires are no doubt the stormtroopers if you were to compare. As your progress through the 5 major scenes in the book you have learned more about each character, but this also leads to more questions. “How does she know how to break encryption?” I asked myself. This leads to even more depth as you really feel for the characters that die. This is a battle after all and there is death. Galaxy Edge Legionnaires face terrible odds throughout the book. Legionnaires always fight the good fight no matter what and this build through the book at the way to the end with a very well planned battle. One that you know they will not survive. I have really enjoyed the book to now. Here is where I have the biggest problem though. The rescue comes at the peak of the battle with death upon them. Then you have an epilogue. It ended so fast I felt let down. They didn’t win, nor did they lose. The epilogue did tie out some lose ends and I realize that there is much more to the series, but the ending really did not do the rest of the book justice. If you are into military scifi then you may want to read this book. If you are listening to these books like I am then, you have to listen to this book. (R.C. Bray does a fantastic job with the voice. I sometimes need to not hear “Skippy” in his voice though.) I was not initially excited to go to the next book, but after writing about it, I know I have to. This was engaging with good characters that will have many more adventures that will no doubt build on this character development. If you want to take a quick listen you can grab it on Amazon here.